Come and enjoy our events and lots of fun stuff we uncover around Scottsdale! It is our pleasure to help with fundraiser and charity events. We also hold fun events like Blow Dry Boot Camp, and Girls Night Out (or in)! Our Blow Dry Boot Camp page will give you all the details on times and registration. Join us on Friday, September 15th, from 5pm to 9pm, here at Enlighten Studio for our Gold Carpet Event! 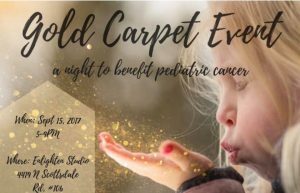 Grab your girls, your gents, and/or your daughters (age: preteen-teen) and enjoy a fun-filled, fashionable evening to raise funds in the fight against Pediatric Cancer. Every year, nearly 16,000 children under the age of 21 are diagnosed with cancer. One in 5 children will not survive their battle. Join our GOLD SQUAD in raising funds and awareness for these brave cancer warriors and their families. ALL EVENT PROCEEDS ARE BEING DONATED to St. Baldrick’s Foundation. Hope begins with us! Note: At 7pm, our Speaker Mary Kay Rodgers will be taking the stage. Please purchase tickets for the event HERE. If you are unable to attend, but wish to donate to the cause, you may also do so HERE. Ladies: if you’re looking to donate your locks to girls battling cancer, please schedule an appointment and enjoy a complimentary cut. During the month of September, Enlighten Studio is providing a Hair Design (shampoo, cut, and blow dry) FREE OF CHARGE for anyone donating hair. We have done our research and found eight companies with different qualifications to meet most hair types and prior chemical services. $5 from every Hair Design we provide between September 11-23rd will be donated to St. Baldrick’s Foundation. Learn more about our events and subscribe to our mailing list. Refer a family member, friend, the gal at the mall who complemented your “do”, or your glowing skin, to your favorite Beauty Advisor at Enlighten Studio. YOU BOTH will receive 10% off 1 service! Make sure to let your friend know you referred them to us. We will keep track of all of your wonderful referrals, and send email updates frequently letting you know what your saving percentage is!